Over the past few weeks, I've been working with Bloggers improved API for Gadgets and have now completed work on several useful gadgets which can be installed with just a few clicks. 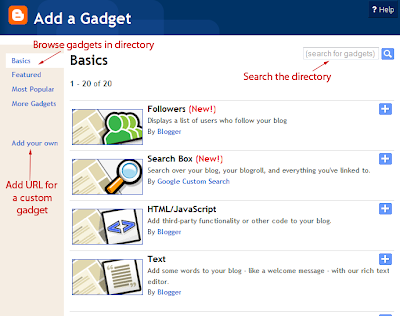 Gadgets can be added from within the Blogger dashboard (so we don't need to use search engines, or visit the owner's site to install). The new API includes the ability to include Blogger post and comment feeds for the blog in which they are installed. Developers can ensure gadgets blend with the theme in which they are installed using "Skins" parameters. Gadgets are as easy to install as Blogger's default widgets. Simply go to Layout>Page Elements in your Blogger dashboard and click the "Add a Gadget" link in the area where you want to install your gadget. From here, you can browse gadgets in the directory, search for gadgets of interest, or add a gadget using the URL where it is hosted. There will be different options here, depending on the gadget you have chosen to install. 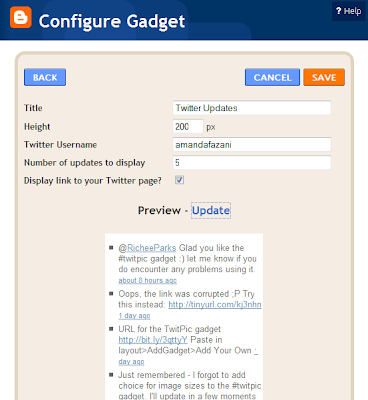 This example shows the configuration options for my Twitter Updates gadget. At the very least, you should be able to alter the title of the gadget, however most gadgets have other configuration options available. A preview of how the gadget will look in your blog will appear below these options (do bear in mind that the width of the gadget may be wider when displayed in your blog if the area in which it is added has larger dimensions than the preview screen). Once you've changed any settings, be sure to click the "Update" link in order to see the changes appear before you save. The gadget will then appear in your blog, and it's position can be changed in the Page Elements section of your dashboard. The Blogger team have created The Featured Gadgets blog which details gadgets of particular interest. Some of these gadgets are also included in the Featured Gadgets section of the Gadget directory (available when you choose to add a new gadget through your dashboard). I'm thrilled to find four of my own gadgets are "featured": Recent Posts, Recent Comments, Picasa Photostream and Twitter Updates, and look forward to seeing the efforts of other Blogger developers in the future. The Blogger team have created extensive documentation for those hoping to develop gadgets for use with Blogger in addition to the extensive resources for creating Google gadgets. I've also begun a three-part series for creating Blogger gadgets over at Blogging Tips to explain the basics including how to utilize Blogger feeds in our gadgets, use skinning parameters and user preferences for customizable gadget utilities. Once you've created a Blogger gadget, you can add it to the Blogger Gadget directory using this link. Your gadget should appear in the public directory within about 30 minutes of successful submission and the best gadgets will be featured in the Featured Gadgets blog. In addition to the four gadgets mentioned above, I have a further three gadgets which are almost ready for public release: a Flickr Photostream Gadget (install with your Flickr username, not the URL of your feed); a TwitPic gadget (to display your recent TwitPic updates) and a Juitter gadget, for real-time updates which mention your username or other search terms. Over the next few days, I'll update with posts for all my gadgets with full details of functions and installation so you can add and enjoy these gadgets in your Blogger powered blogs. I hope you will enjoy using Blogger gadgets which use this improved API and look forward to seeing gadgets which other developers create. If you've created a gadget for Blogger or if there's a particular gadget you'd like me to create, please let me know by leaving your comments below.